I don't know what kid - or grown up does not like some sort of Beefaroni! 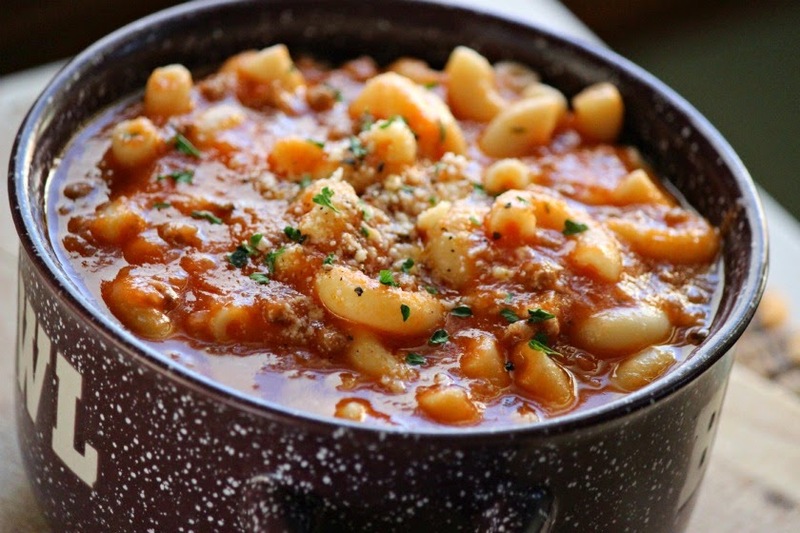 AKA as goulash or American Chop Suey, it's always a favorite. When I was growing up, my Aunt used to make this for us for lunch - minus the ground beef. 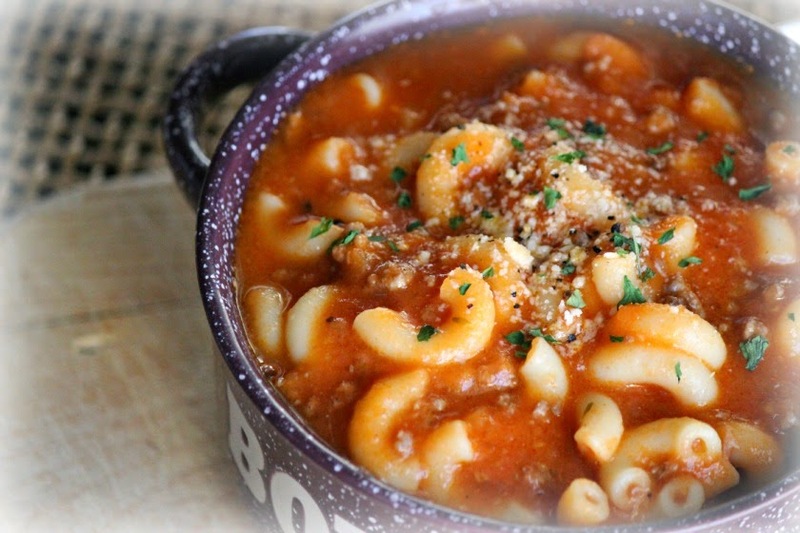 Just elbow macaroni in tomato soup - Well I thought it was the best thing since sliced bread! Mom would have it ready for us when we came back from Trick-or-Treating so I grew up with fond memories of this simple dish and I still make the "simple version" when I want some comfort food. If you grew up on the soup in the red and white can (which I still love) be prepared to be blown away by this light, yet creamy version. Heat the oil and butter in a 3-quart saucepan until the butter melts. Add the onion and garlic and cook, stirring occasionally, until softened but not browned, about 8 minutes. Add the flour and stir to coat the onion and garlic. Add the broth, pureed tomatoes, sugar, thyme about 1/2 teaspoon each of salt and pepper. Bring to a simmer over medium-high heat while stirring to make sure that the flour doesn't stick to the bottom of the pan. Reduce the heat to low, cover, and simmer for 40 minutes. Get your salted water boiling and cook macaroni to desired tenderness. Drain. In the same pot, brown ground beef. Drain any excess fat. Let soup cool briefly. Discard the thyme spring. Puree in 2 batches in a blender or food processor. Return the soup to the pot. Add cooked macaroni and ground beef. Stir in 1 Tbsp. unsalted butter and Parmesan cheese. Bring all ingredients back to a simmer and serve immediately! Season with salt and pepper to taste. If you have had Chef-Boy-R-Dee Beefaroni, you know that it's very "saucy". You may want to add additional Parmesan cheese to really come close to the canned version. The Beefaroni noodles are very hard to find, but Barilla makes a line of small versions of all sorts of pasta. If you can find it, buy the small ziti.